Liam Shephard (left) tries to encourage Leo Da Silva Lopes during the heavy FA Cup defeat at home to Leicester. Photo: Joe Dent/theposh.com. Peterborough United will use the agony of back-to-back cup exits to boost their League One promotion bid. Posh were thumped 5-1 at home by Premier League Leicester City in the FA Cup yesterday (January 27) just a handful of days of losing 4-2 at Lincoln in a Checkatrade Trophy quarter-final tie. Posh full-back Liam Shephard on the ball in the 5-1 defeat by Leicester. Photo: Joe Dent/theposh.com. The players will now lick their wounds ahead of re-starting their League One programme at home to Southend next Saturday (February 3). 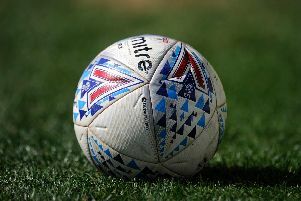 Southend enjoyed a dramatic 3-2 win over promotion hopefuls Scunthorpe yesterday in new manager Chris Powell’s first game in charge, one of several results to go Posh’s way. Grant McCann’s men are eighth, four points outside the play-off places, but with a game in hand on sixth-placed Rotherham and two games in hand on fifth-placed Bradford City who are fading fast. “Our main focus since the start of the season has been on getting promoted.” Posh full-back Liam Shephard. “We believe we are good enough to play in the Championship so the aim now is to get into the play-offs and then win them. “We won’t meet League One sides who play like Leicester. They were so well organised and they took their chances. We looked nervous early on and made a few mistakes which they capitalised on to kill the game pretty quickly. “We fancied our chances before the game. We played really well as Aston Villa in the last round and we felt we could play that well again, but Leicester pressed us so well we found it hard to play the way we wanted to. “And when we did get out our decision-making wasn’t great. Whereas we just whipped crosses into the penalty area, Leicester made sure they picked out a player. They showed their Premier League quality to be fair, while we were a bit naive. “When we are being pressed that well, we need to make better angles for each other. We did better at the start of the second-half and we had half a chance to get back to 3-2, but it wasn’t to be. Automatic promotion contenders Blackburn (home to Walsall) and Wigan (away to Rochdale) are in League One action on Tuesday (January 30).